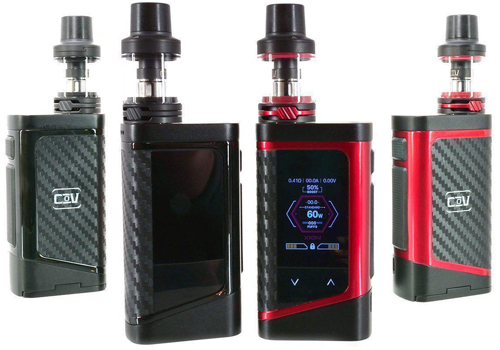 Here are cheap deals for the Council Of Vapor Xion Box Mod Kit.This all-in-one bundle features 240 watts of output, dual batteries, a 1.45 inch full color TFT touch screen, a full temperature control suite, a 3.1ml capacity, a top fill system and bottom adjustable airflow. Measuring 85mm x 47.5mm x 29mm, the design incorporates a zinc alloy chassis with carbon fiber inlays in either black or red. On the front, you will see a massive 1.45 inch TFT screen that utilizes touch control to navigate the menu system. Not many details are available about the menu’s vape data, but we will update the information as it becomes available. Controlling the Xion Mod occurs via two physical buttons, but adjustments are made via the touch screen. At the top, you will see a springloaded/gold plated 510 connection bezel for easy atomizer installation with excellent electrical conductivity during mod firing. On the bottom is where you find the unit’s battery panel that hides dual 18650 batteries that can be charged via the micro USB port. On the technical level, the Xion Box Mod can operate in power mode that also features three taste modes: soft, standard, powerful and a boost mode to set wattage output over time. Additionally, there is a full suite of temperature control modes that are compatible with nickel, stainless steel and titanium heating elements or use the TCR mode for preciser resistance settings for your coil. The maximum power for the unit is 240 watts, the highest temperature should be around 600 degrees Fahrenheit and the resistance comes in at a very low 0.05ohm. There’s also plenty of safety protections built into the mod that include reverse polarity protection, overtime protection, over-current protection, overcharge protection, over-discharge protection, short circuit protection and low resistance protection. The included Xilo Tank in the Xion Kit has a 22mm diamter and is made from stainless steel with glass. The tank reservoir is capable of storing up to 3.1ml of juice and can be refilled via a top fill setup that slides the top cap to reveal a large fill hole. Airflow is adjustable via the bottom airflow control ring that is built with dual air slots that measure 9mm x 2.5mm. This atomizer uses Xilo coils that have a resistance of 0.4ohm and fire in the range of 20 to 80 watts. For health, the coils are made with organic cotton.